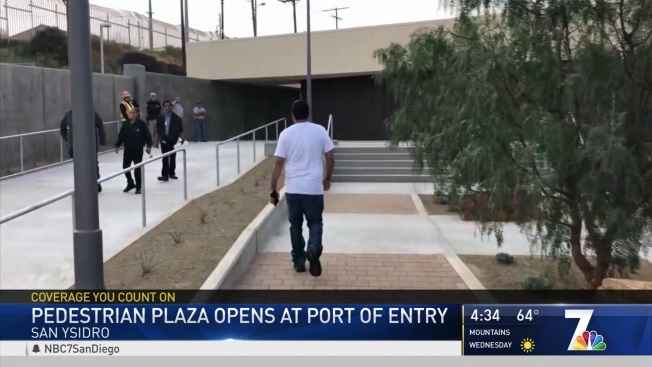 A new plaza opened Monday to connect San Diego's transit system to the San Ysidro Port of Entry's Pedestrian East processing facility, adding convenience to foot travelers en route to Mexico. The newly constructed plaza and walkway are part of an ongoing construction project to ease travel for the tens of thousands of people who pass through the world's busiest land border crossing every day. The plaza is located immediately south of the Metropolitan Transit System's trolley and bus station, allowing travelers to walk along a pathway directly from the trolley plaza south into Mexico. Last August, 22 pedestrian processing lanes were opened at the Pedestrian East (PedEast) facility as part of the General Services Administration's (GSA) $714 million, three-phase port expansion project. With the completion of the pedestrian plaza, phase two of the massive project has been completed. The final phase of the expansion project includes adding north and southbound inspection facilities to Interstate 5. Once all three phases of the project are complete, in winter 2019, GSA said the port will have 62 northbound vehicle inspection booths and more than double the amount of southbound I-5 lanes that connect to Mexico's new El Chaparral facility.